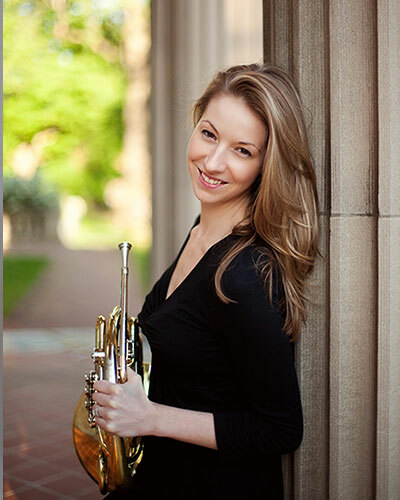 Lauren Becker is Assistant Professor of Horn at the Crane School of Music at SUNY Potsdam. Active as an orchestral and chamber musician, she has performed with ensembles throughout the United States and beyond, including the Albany Symphony, Symphoria, Rochester Philharmonic Orchestra, Detroit Symphony Orchestra, Buffalo Philharmonic Orchestra, Kuala Lumpur International Festival Orchestra, North Country Chamber Players, and Potsdam Brass Quintet. As a member of Music in the American Wild, she performed world premieres of newly commissioned compositions in eight U.S. National Parks and Historical Sites during the summers of 2016 and 2017 to celebrate the centennial of the National Parks Service. Lauren has performed and presented at many conferences, including the International Brass Festival, Erie County Music Educators Association Western New York Conference Day, NAfME Eastern Division Conference, and NYSSMA Winter Conference. Prior to her appointment at Crane, Lauren taught at Nazareth College, the University of Rochester, and the Eastman Community Music School. She has also served as horn instructor and chamber music coach at Crane Youth Music, Batawagama Band Camp, and the New York Summer Music Festival. She holds Doctor of Musical Arts and Master of Music degrees from the Eastman School of Music in Horn Performance and Literature, where she was awarded the prestigious Performer’s Certificate and the 2013 Teaching Assistant Prize for excellence in collegiate teaching. She received a Bachelor of Music in Music Education from the University of New Hampshire.